Boxer Joe Cordina says it "means everything" after securing his place at this summer's Olympics. Cordina became the fourth Welsh athlete to qualify for Rio by beating Ireland's David Joyce in the 60kg semi-final at the European qualifier in Turkey. The 24-year-old will now meet France's Sofiane Oumiha in the final after he overcame home favourite Volkan Gokcek. "It is six years of work," said the 2014 Commonwealth Games bronze medallist. 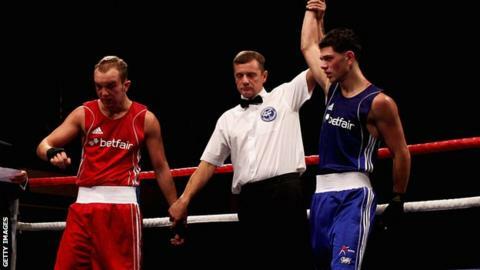 Cordina, European amateur champion in 2015, was beaten and stopped by Joyce four years ago when the Cardiff boxer was trying to secure a place at London 2012. "It feels amazing," Cordina told BBC Sport. "This came around at the right time for me. "When I fought David Joyce four years ago in an Olympic qualifier he beat me. "I was young and inexperienced and even though I started well, he kept on coming and ended up stopping me. "So it was good to get one back on him." Cordina will join shooter Elena Allen, triathlete Non Stanford and sailor Hannah Mills on the TeamGB plane to Brazil while world number one defending Olympic taekwondo champion Jade Jones has virtually sealed her spot. Cordina trains with 2012 Olympic welterweight silver medallist Fred Evans, IBF world featherweight champion Lee Selby and 2010 Commonwealth Games bantamweight champion Sean McGoldrick at Newport's St Joseph's gym.